Performances of the LSU alma mater by the LSU Tiger Band are amazing to watch and listen to. The lyrics function as an anthem to the school, and students sing it at sporting and academic events to show their devotion and fondness for the university. Most associate the alma mater with football pregame performances. However, the alma mater is not to be confused with the LSU fight song, “Fight for LSU”, which is also played at football games. Here, we’ve provided the lyrics to the LSU alma mater, along with additional background on the song. Sheet music and instructions for playing the song can be found here: LSU Alma Mater Arrangement You Tube. The mention of stately oaks and broad magnolias in the first line of the alma mater refers to the prevalence of oak trees and magnolia trees on the LSU campus. According to an article on LSU Now, there are over 6,000 trees on campus, which are aesthetically pleasing, provide shade, and hold a lot of history. Students love to hang their hammocks between the trees, or rest on the grass under the shade of the tree branches. Efforts to keep the campus beautiful and green include participation in Arbor Day and the Endow an Oak program. The alma mater is played by the LSU Tiger Band pregame and at the end of each home football game. While it’s played, students lock arms and sway side to side as they sing from the stands. The band also has a tradition of joining arms at the end of Saturday rehearsals to sing the alma mater before leaving practice. 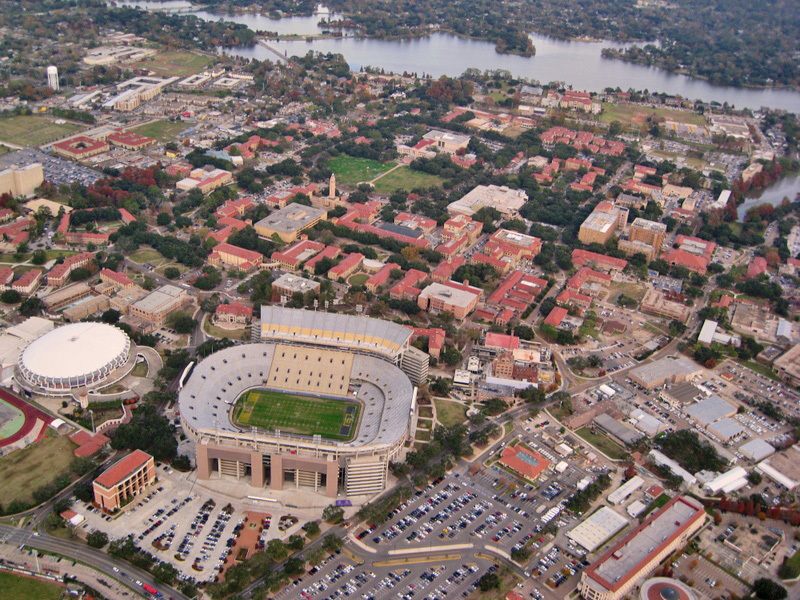 The LSU alma mater was written in 1929 by Lloyd Funchess and Harris Downey. Funchess and Downey were students of LSU. They wrote the alma mater to replace the original, “Far Above Cayuga’s Waters”. Cornell University had begun using the same song, and the two students felt LSU should have their own original alma mater. Check out this video of the LSU Tiger Band singing the alma mater after a practice. The vocal rendition is so beautiful, it’ll give any Tiger fan goosebumps!